Economical Lift Solution !!! 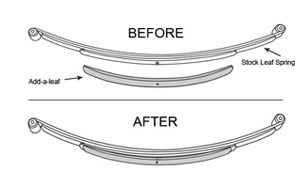 Tuff Country Add-a-Leafs are designed to add a small amount of lift (1.5 to 3 inches) to vehicles with leaf springs. Just add to your stock leaf springs. Once added to existing leaf springs these will also slightly increase your load capacity. Add height and weight capacity with an Add-a-Leaf Kit! Cheaply priced doesn't mean you get cheated on quality with these Tuff Country Add A Leaf Springs. By adding these to your existing leaf springs, you will find an economical lift solution and also increase your load capacity. If the rear of your vehicle is sagging due to added weight and your headlights are lighting up treetops Tuff Country kits will eliminate that sag and add height to level your vehicle. Add-a-leafs are installed into existing leaf springs of many trucks and suv's including Chevy, Ford, Dodge, GMC, Jeep and Toyota vehicles. These leaf's high spring rate will give additional arch to old or worn springs. This will generally lift a vehicle between one to two inches depending on the make and model and condition of existing springs. Installation difficulty can vary depending on the condition and age of the factory springs. Older rusty springs generally make the installation a little more difficult. You may also need to replace old rusty u-bolts simply because it is sometime easier to cut the old u-bolts off.